2014 Champion Hurdle previewWho can beat the 'Fly this winter? It's the fourth race of 27, and arguably the best. Yes, this year's Champion Hurdle is a chuffing howitzer of a speed scrap, featuring established class versus rising stars in a battle of the generations. It's also a fiendishly difficult punting puzzle, and in this post I'll attempt to piece together the key known elements. Age: The only two double-digit aged winners since the Champion Hurdle was first run in 1927 were Hatton's Grace (won aged 9, 10 and 11 1949-51) and Sea Pigeon (aged 10 and 11 1980-81). Hurricane Fly bids for a third Champion Hurdle aged ten. At the other end of the age spectrum, Katchit was the only five-year-old to win the Champion since the first of See You Then's hat-trick in the race in 1985. Katchit, like Our Conor - who bids to win as a five-year-old this time, was returning to Cheltenham as the winner of the previous year's Triumph Hurdle. Six to nine year olds have won 28 of the last thirty Champion Hurdles. Last time out: 41 of the 48 win and placed horses since 1997 finished first or second last time out. They also accounted for fifteen of the sixteen winners during that time. The other winner finished third the last day. Cheltenham Form: Twelve of the fourteen winners since 1997 to have previously raced at Cheltenham had a place record of at last 75% at the track. Ten of them had a 100% place record at the track. The New One was 'only' sixth in the Champion Bumper. Days since a run: Only Rock On Ruby, absent since Boxing Day, had failed to run earlier in the same year as when winning the Champion Hurdle since 1997. The New One has been absent since the same day as Rock On Ruby was. In truth, there's very little to glean from the trends except that Hurricane Fly's age negative is mitigated by the feat of other serial winners. Likewise, Our Conor is bidding to emulate Katchit in following up a Triumph Hurdle win with victory in the Blue Riband. The New One has a couple of minor knocks, but it would be careless to omit him from consideration on those grounds alone. Jezki finished fourth last time out, which is worse than any winner this century, but again, context is needed there. Hurricane Fly missed his first intended engagement at the Festival back in 2010 after a late injury ruled him out. He made up for that in 2011 by repelling the valiant Peddlers Cross in the Champion Hurdle. In 2012, some folks - including me - feel he should have won again. Given plenty to do at the top of the hill, it seemed that Ruby Walsh on the Fly was exclusively preoccupied with what Tony McCoy - aboard Binocular - was doing. Walsh was looking to cover McCoy's every move, and so he did. Unfortunately, the bird had flown in front of them, with Overturn setting the race up for Rock On Ruby. Hurricane Fly was a never nearer five length third, besting Binocular into fourth in the process. Last year, there was no such error (if indeed you subscribe to the notion that jockeys - contrary to what some of them bleat - actually can, and do, make mistakes). Walsh shovelled on the coal at an appropriate juncture, and his willing mount reversed form with Rock On Ruby to claim Champion Hurdle number two. The Hurricane is now unbeaten since that Ruby reversal in 2012, which was his only defeat since November 2009. True, he's often duffed up the same nags in short fields in Ireland. But if that's crabbing the champ, then it's hard to argue with his record when he's ferried over to Gloucestershire. However. How. Ever... He is a ten year old now, and in the likes of The New One, Our Conor, My Tent Or Yours, and Jezki, he faces a brand new battalion of fleet-footed aspirants. Allied to that, his form this season - whilst undeniably progressive from race to race - has been at a lower level than last season. Indeed, according to Racing Post Ratings, his best run this year (RPR 168) fails to measure up to his worst run last year (RPR 169). 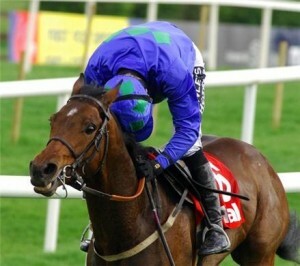 I love Hurricane Fly. I have a deep reverence for him too. But it would be disappointing for the near future of the Champion Hurdle if at least one of his young upstart rivals wasn't good enough to do him for toe. The New One has been a talking horse for a long time. And, in his defence, he's done plenty of talking on the track too, with a record that shows only one run - the 2012 Champion Bumper - outside the first two. But that's a sequence which does include three - granted, narrow - defeats in his last six races. And, having failed to pierce the 170 Racing Post Rating barrier to date, as well as having a longer than ideal absence to overcome, I think he's terribly short atop the market at 11/4. 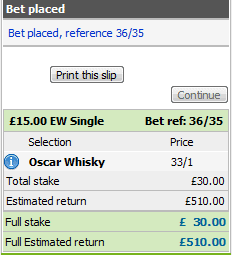 The next pair in the betting, at 9/2 or so, are Our Conor and My Tent Or Yours. Our Conor was a breathtaking fifteen length winner of the Triumph Hurdle last year. That race hasn't worked out brilliantly, and he's been beaten in three starts since. First, he finished fourth in a big field flat handicap at Naas; then he ran third - beaten six lengths behind Hurricane Fly in the Grade 1 Ryanair Hurdle at Christmas; and last time, he was just a length and a half behind the fly in the Grade 1 Irish Champion Hurdle. Dessie Hughes has brought him on slowly this year, as undoubtedly has Willie Mullins with the Fly, and I think it will be very close between the pair on the opening day of the Festival. Our Conor bounded up the hill last year, and it's not hard to see him doing the same again this term. He too has something to find on the numbers, though. That hill would be the question mark with My Tent Or Yours who, a slight wilting behind Champagne Fever in last year's Supreme Novices' Hurdle aside, has a good looking profile for the race. He sneaked a prep race in a jumpers' bumper a month before the Festival and that should have him cherry ripe to give his best. Whether that is quite good enough, against rivals who may finish their races better remains to be seen. He does have the beating of The New One on Christmas Hurdle form, though, and it's quite hard to see why he's a bigger price than that rival. [Note, as I write, there seems to be some unease in My Tent Or Yours' price, and an announcement from Henderson's yard should illuminate further]. Assuming Annie Power goes for the World Hurdle, Jezki is next at around 10/1. He was undeniably disappointing last time when fourth of four in a tactical scrap with the Fly, Our Conor, and pacemaker, Captain Cee Bee. If that run can be ignored - and I'd suggest it can, as it hardly compares to the full tilt of a Champion Hurdle - then he has little to find with both My Tent Or Yours and Hurricane Fly. Little to find, yes; but he does have to find it, and that's a leap of faith I'm not really prepared to take. Un De Sceaux is another expected absentee, which is a pity, because his heart-on-sleeve bamboozling front-running style would have been a fascinating sub-plot to the race. Ignoring the outsiders Grumeti, Ptit Zig and Thousand Stars, the only remaining possible is Melodic Rendezvous. And, if it came up boggy on day one, he'd be a very interesting contender. Let's be clear, despite being a 20/1 shot, he's a Grade 1 and triple Grade 2 winner. Moreover, he's won six of his eight hurdles starts, and was plainly 'wrong' when down the field in the Fighting Fifth, a race in which recent Champion Hurdler Binocular was also turned over. He's a very good horse, and managed second to Champagne Fever in the Punchestown Champion Bumper on just his second lifetime run. Coming here off the back of a workmanlike performance when seeing off Zarkandar in the Kingwell Hurdle - itself a strong trial for the Champion Hurdle - Melodic Rendezvous had plenty of 'tightening up' to do in the intervening four weeks, and trainer Jeremy Scott seemed quietly excited at his charge's prospects at a recent London Racing Club event. The 2014 Champion Hurdle is a really trappy race. It's not clear from where the pace will come, and it's not clear what the ground conditions will be. The best guesses are that the supplemented Captain Cee Bee will lead, and that the ground will be good to soft. If that comes to pass, then the value - such as it is in a race where the bookies have a strongarm grip on the form - might be with Melodic Rendezvous, who can go on good to soft, at 20/1. My Tent Or Yours has, I think, a better chance than The New One at twice the price IF he's untroubled by that injury scare. It's a race in which I'll be waiting until the day to back up my Melodic Rendezvous ante post ticket. But, when the day comes, I'll most certainly be using Ladbrokes' 'Money Back as a free bet if Hurricane Fly finishes first or second' offer. That is a cracking concession as the old boy looks nailed on to run his race, and we'd need two to get by him in order not to at least get a second bite of the Cheltenham cherry.